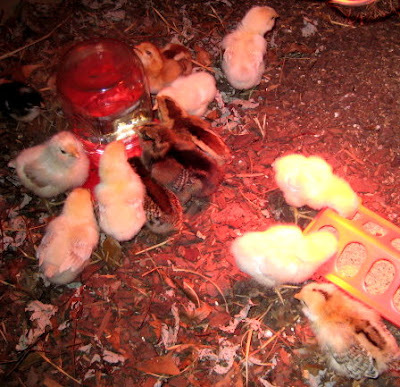 It's hard to believe we've had our chicks for over two weeks. They've been in the chicken coop a little over a week now. We moved them from the house on the one week anniversary of their arrival. We figured it was time. They were discovering that if they ran, jumped, and flapped their wings all at the same time, something wonderful was starting to happen. Two Barred Hollands on the left, Ameraucana on the right, everybody else in the back. All wondering what that flashy box is all about. 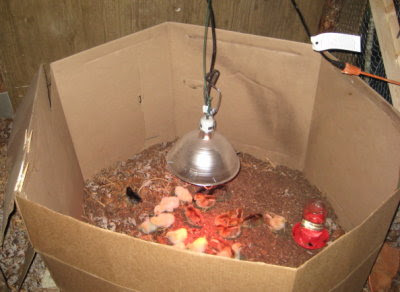 The red brooder light makes it difficult to show their colors well. That's an Ameraucana in the left foreground, Welsummer behind it on the right, Delawares behind. 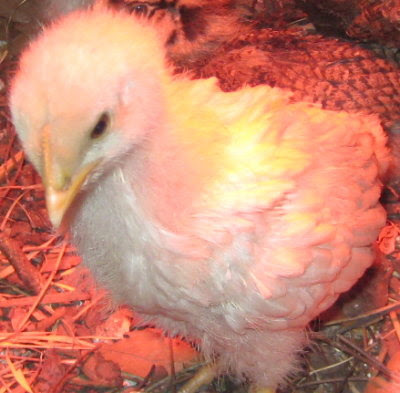 They are feathering out nicely, as this Delaware chick shows. Also starting to grow their combs. Look closely at this Welsummer chick's head. 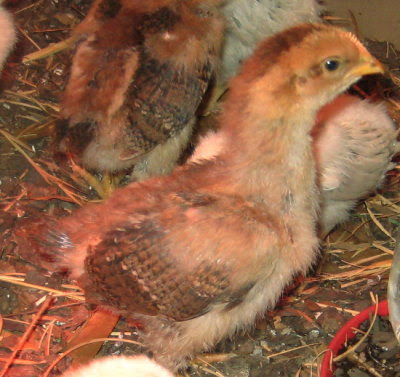 The little black Barred Holland chicks are no longer black, but starting to develop their bars. They are the smallest, but boldest of the lot. Welsummers and Ameraucanas. 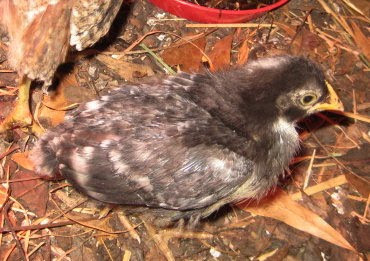 They are all definitely starting to look like miniature chickens. They are fast heading for the teenage uglies. Nothing quite like chickens right befoe they become adults. They look happy and healthy. Beautiful flock! They really do look good. It will be so much fun to have a diverse flock running around. 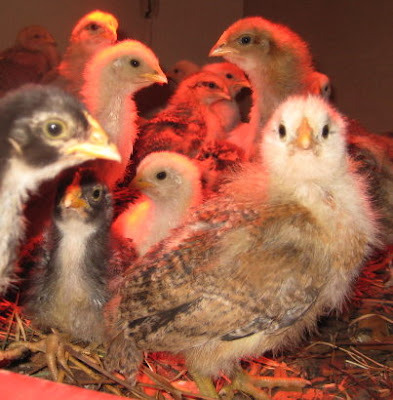 Your chicks are sure growing fast. Before you know it they'll be laying eggs. Fresh eggs. YUMM!!! looks like it will be very fun at your place soon. What does Rascal think? I'm glad that they are doing so well for you. 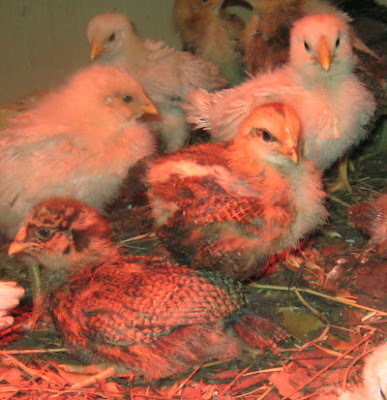 There is nothing cuter than chicks! They are adorable! Keep posting pics, please! Maggie, have you checked into whether or not you can keep chickens as pets? Some towns allow you to keep a couple as pets, but not livestock. Bettina, good comparison. It has been a pleasure having them. I hope your DH is agreeable! Barb, I am really looking forward to that! At the moment fresh eggs seem far away, but I know the time will get here quickly. Sharon, *LOL. I've very glad mine have all their feathers! Renee, oddly, Rascal is only nominally interested. When I say "let's go check on the chickens" he's more interested in climbing up their ramp and trying to get out the chicken door. 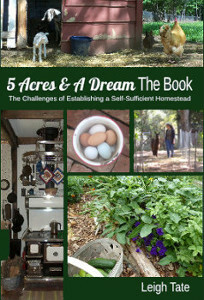 Chickens are just so darn much fun! And you get fresh eggs to boot! T.
They are cute. Will you use them for food also, or just eggs? Tina, I confess, we are really enjoying them. I never realized chickens could be so entertaining. Cyndy, we got straight run, so as you can imagine, I'm trying to guess who's a roo and who's a pullet. Deep End, we only plan to keep one rooster, so the rest will be butchered. 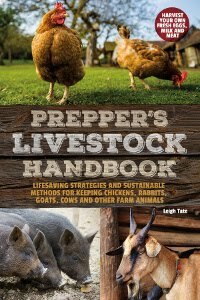 Some readers have mentioned that the so called "dual purpose" breeds aren't all that good for meat and recommend raising a separate meat flock. We haven't gotten that far in our thinking yet. Still just taking it one step at at time. They are growing fast! It just makes me want to get start outside so we can get some. They are just so cute I can't wait to hear more! The chickens are so cute! They look really funny when they start to get adult feathering. It is amazing how fast the chicks grow! I love all those little feathers. Oh, they are so cute. 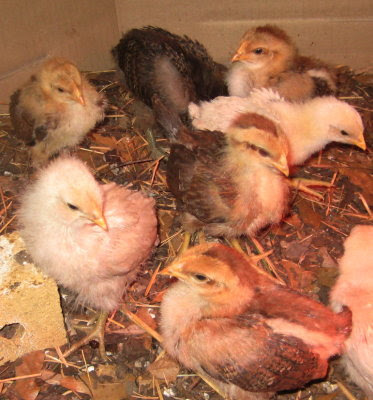 I had to restrain myself when I saw baby chicks in at the farm store. I don't need any more chickens at the moment. They grow amazingly fast. They are only fully fluffy for a couple days and then those wings are coming in. I am sure if you stared at them long enough you could see them grow. They are super cute. Congrats on being a chicken mama! Julie, speaking of outside, I can hardly wait to let these little guys out. Charlotte, they are as funny to watch as they are to look at. Very entertaining. Callie, it's really neat isn't it? I had read that they grow quickly, but didn't realize how much so. Leslie, I check on them several times a day and it seems as though they grow visibly in between visits!